1. 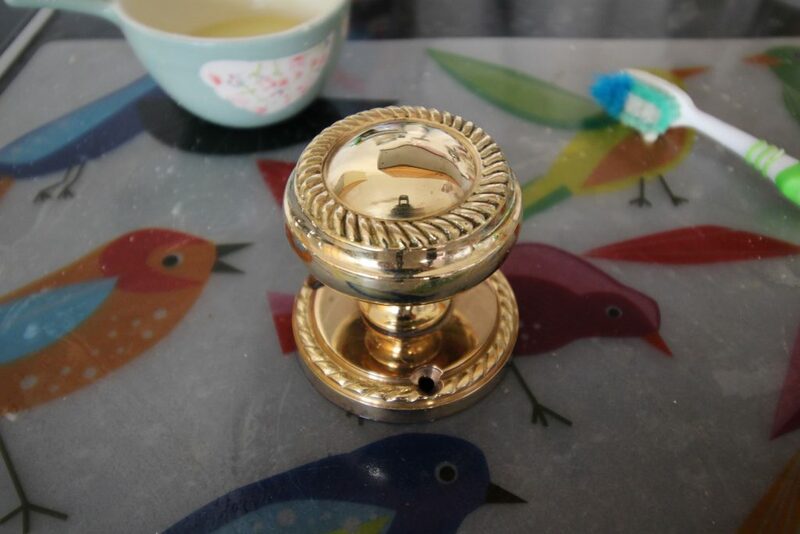 To clean the paint off the knobs, I brought a big pot of water to the boil and popped in a splash of laundry detergent. 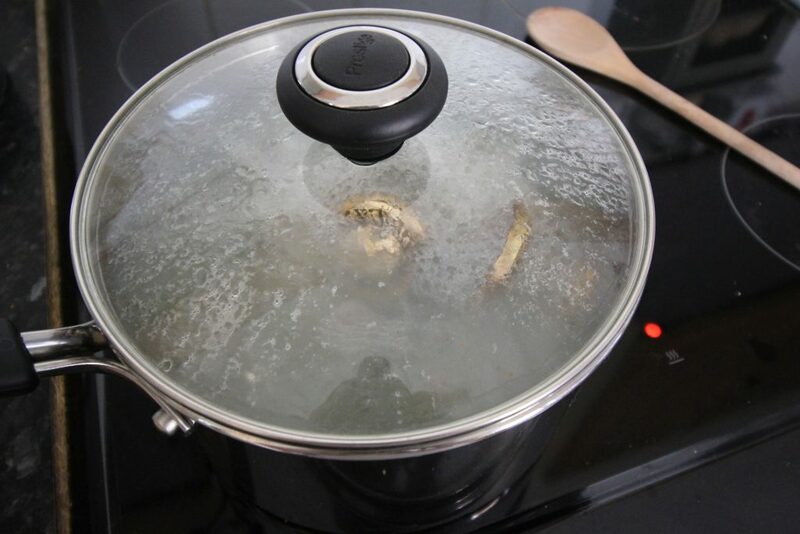 I then put in all the knobs, put the lid on the pot and reduced the heat to allow it to simmer away. Use a pan you don’t plan on cooking with again! 2. Then all you need to do is leave it, so you can get on with something else. Check on it after about an hour and see if the paint has loosened. An hour was all it took for all of the paint on mine to come off. 3. 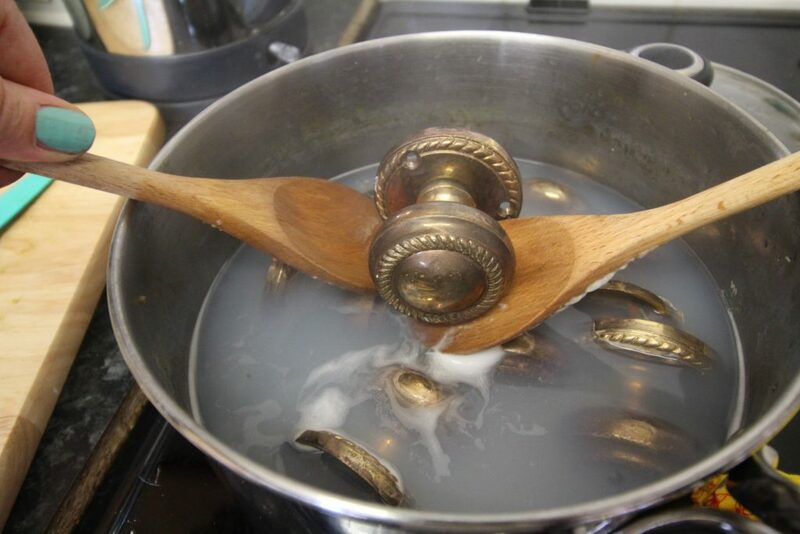 Carefully take the knobs out of the pot. Use tongs if you have them – they’re hot! I used two wooden spoons. I did one at a time, lifting it out onto a cloth and then running it under cold running water for a few seconds to cool it. All the paint should have fallen off at this point. 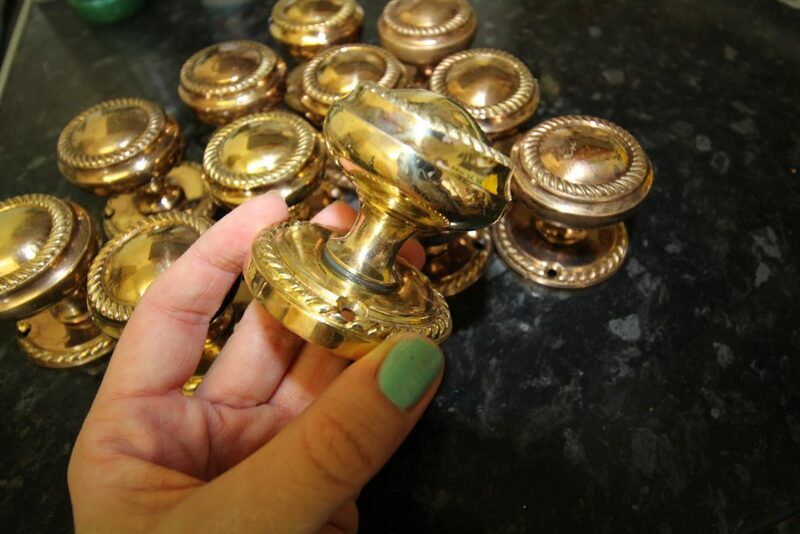 Once all the paint was off, I needed to clean and polish the knobs as they were still quite stained. There are cleaners that you can buy but I used natural products that I already had in the kitchen and they worked perfectly! 1. 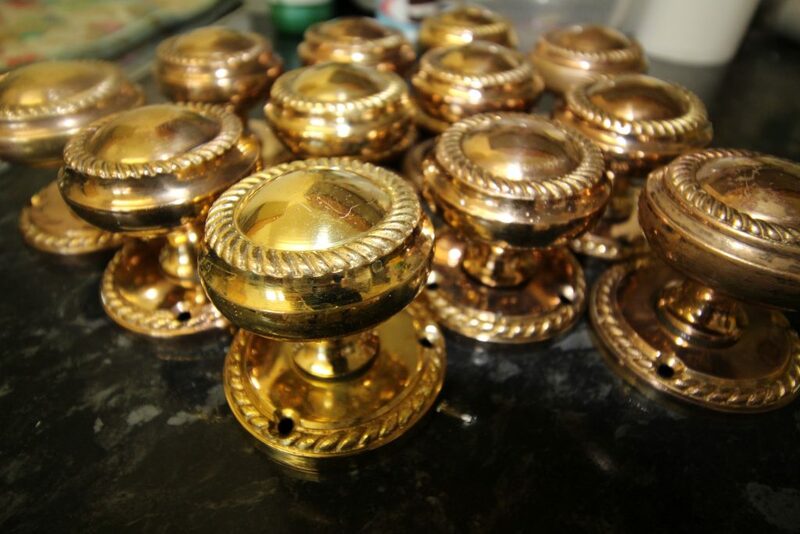 To clean the brass, make a paste with lemon juice and bicarbonate of soda (or baking soda). 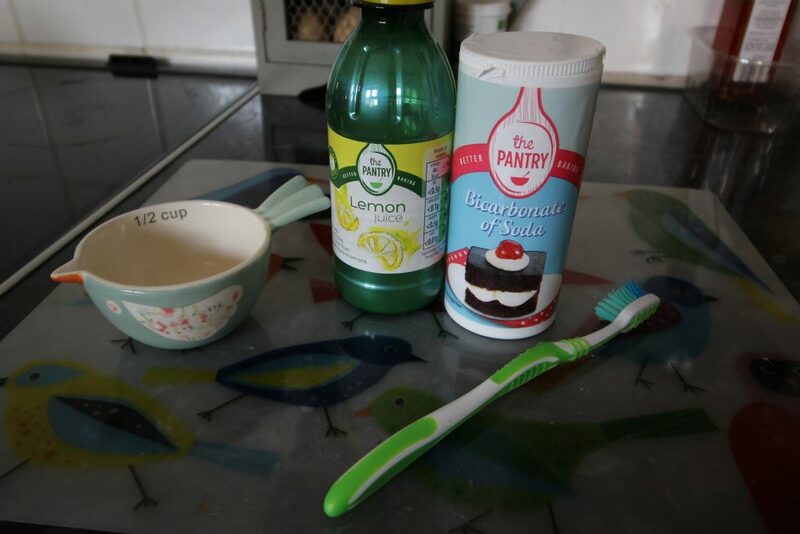 I put the lemon juice in a cup first and then added the bicarbonate of soda until I’d created a paste. Make sure you add the bicarb a little at a time – add too much at once and it will fizz up and overflow! 2. 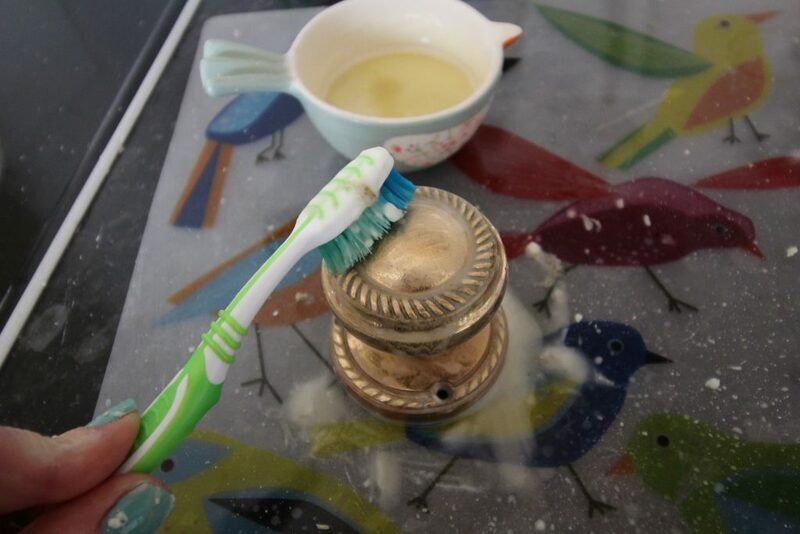 Once you’ve made your paste, use an old toothbrush to gently rub it over the brass knobs. There’s no need to be heavy handed – you’ll be surprised how easily they clean up and you don’t want to cause any scratches. 3. Once you’ve given them a good clean, rinse the knobs under running water. They should be clean at this point, but give them another clean with the paste and rinse again if not. 4. Once you’ve rinsed them, dry them off and give them a polish with a clean, dry cloth. 5. Admire your reflection in your shiny new knobs and pour yourself a glass of wine to reward yourself for a job well done. Just had my doors painted today! 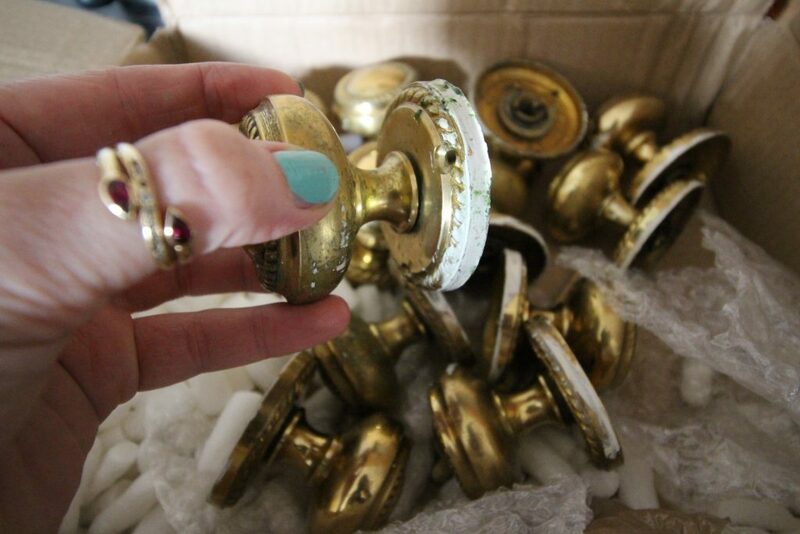 going to clean my brass door handles tonight, I hope they come up as good as yours! Thanks a lot for the tips. Very helpful. Lemon juice is nature’s cure for everything I swear! Awesome tips! Awesome post with very helpful, practical and easy-to-follow tips. I didn’t know that lemon juice was so versatile! And I literary get to read this just one week after I threw my brass accessories. God dammit my luck :D.
what a great job! 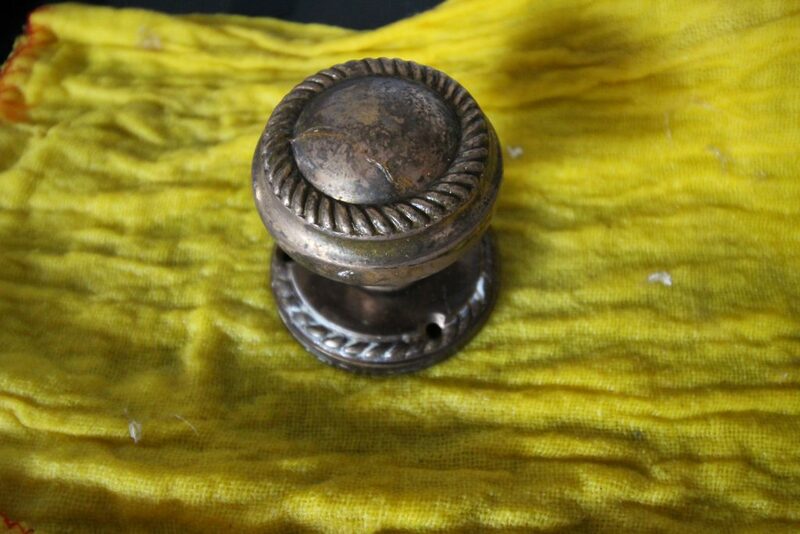 and yes knobs especially brass are expensive. good to know the next time I’m at a thrift store or flea market. 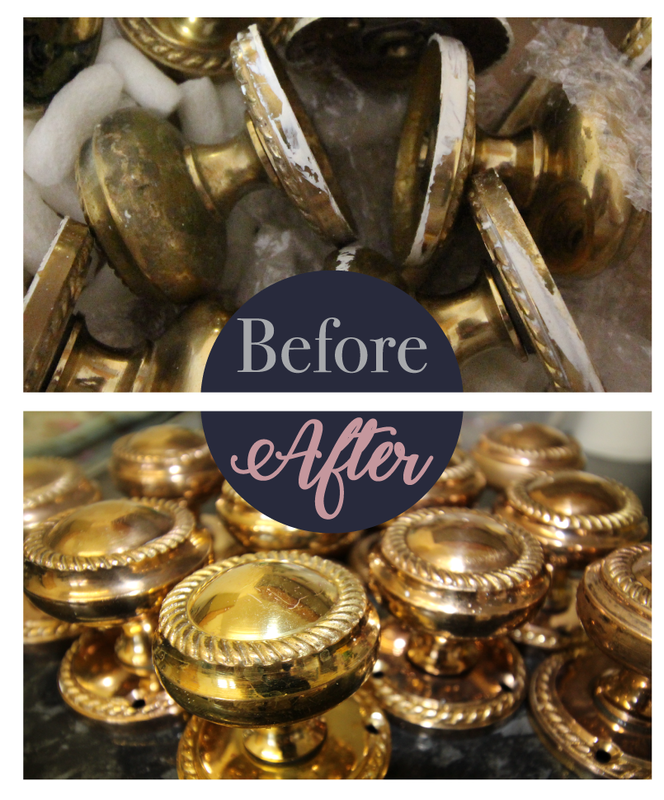 This is exactly how my grandmother used to clean brass! This is really good! They look as if you just bought them today. Sounds like a great technique. Would be great if there’s a way so that we can still use the pan after the cleaning process.